Although uncommon, there are some instances when papers issued by Govt. misspell our names or other details. It may seem like a common mistake but its repercussions are many. If your name is spelled inconsistently in different documents, some officials may reject it. Although it is possible to get it corrected, it may be simpler to just make an affidavit saying that you are indeed the person being mentioned in a certain document. That is what the affidavit for one and the same person is for. Normally, such an affidavit would be drafted by a lawyer so the deponent must approach a lawyer with the documents where his/her name has been incorrectly printed. The lawyer then drafts an affidavit for you, prints it on Stamp paper and gets you to swear it before an official with the power to witness an oath. This method may not be suitable for everyone especially folks who are super busy. 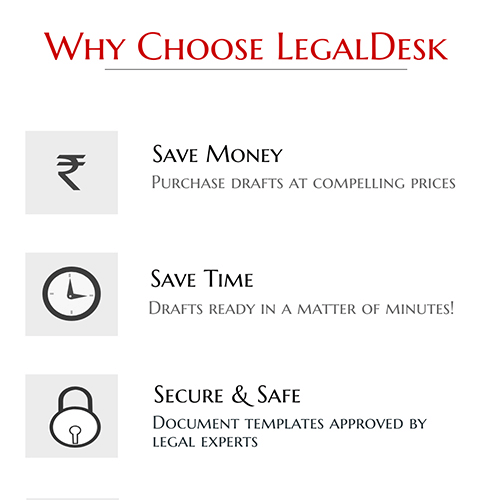 LegalDesk offers ready to use, pre-drafted agreements that can be created in a few minutes. All you need to do is fill in your details and then do a thorough review. After that, you can either print it yourself on Stamp paper or you can let us handle that part and send you a Stamp paper printed copy. There are many cases when you need to make an affidavit to handle name discrepancies. Name differs in certificates issues in school or colleges. What Should Be Included In The Affidavit? The procedure to make this affidavit legally valid is no different from that of validating other affidavits. The deponent must prepare the affidavit and print it on Stamp paper of recommended value and swear before an official who has the authority to witness and validate oaths. Once both the deponent and the official who witnessed the oath signs the affidavit, it is considered legally valid. For those of you who have neither the time nor the money to go about getting this done by a lawyer, LegalDesk will provide you with templates that are lawyer verified. All you need to do is simply fill in your details and pay a nominal fee. We also have the provision to print your affidavit on Stamp paper and mail it to an address you request. Try it now!